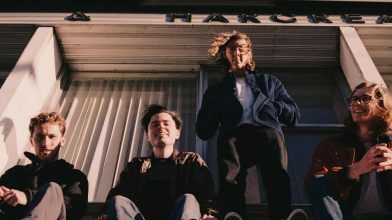 After leading in with the criminally catchy Colour Me In and the self-reflective Dark Side Of Me, today Carvel are offering up a sneaky preview of their upcoming Carvel EP. Ahead of official release on April 27th, you can wrap your ears around the band’s first EP since 2015 below. Plus read on to hear what they’ve said about each track, how it came together, and what the Carvel EP means to them. Colour, concept and character: the Carvel EP marks a turning point for the band, a release that sees Carvel solidify their groove like never before. Dark Side of Me is the tone-setter for this EP, and the first song we wrote for it. In today’s musical climate with streaming services dominating consumption, it’s usually in your best interest to have your lead single take the number one spot on your release, but we couldn’t have it any other way. Introspective and personal in meaning, it is the beginning of the lyrical narrative of this EP and introduces you to the textures and tones you can expect from the guitar work. Dark Side of Me was written just after finishing our debut release, ‘For the Birds’, so you can hear the acoustic roots and similarities that defined our songwriting in that era, but also the psychedelic swirl that sparked our direction for the new EP. Colour Me In is our funk-pop follow-up to the opening track, and was an opportunity for us to show off our pop muscles. This track was by far the most fun we have had putting a song together. Every pre-conceived notion we had about what our band should sound like, what our image should be, was thrown out the window in favour of a funky p-bass line and a fat pop chorus. We even used a Lydian mode guitar solo which was commonly used in the ’70s for that extra-cheesy rock sound. This song actually began as a more subdued folk riff, and we sped it up until it became the funk-jam that it is today. Keeping with the colour theme of the EP, Fading continues the lyrical story and deals with some heavy emotions like mental health, and fading relationships. The song is a crunchy, fuzzy, and at times almost a prog-rock sounding ballad. We recorded the guitars in an empty stone room and turned our Fender Bassman and Vox AC30 amps to 11 (literally). We have never heard anything louder than the guitar solo on this track. After the solo finished, one of the amplifiers picked up a radio signal and you can hear it blasting through the amp just before the last chorus. We decided to keep that in the recording. Overtime was our second song written for the EP, and was one of the few songs that remained largely untouched to its completion. It’s always been one of our favourites for its chilled and driving vibe. It features a groovy chorus, and half-time psychedelic guitar solos. This song is fairly unique for us in that usually the Stratocaster is undeniably our go-to guitar and cornerstone of our sound, but in this song we used a Telecaster for all of the lead guitar parts. The outro is one of our favourite moments on the whole EP. Abating God is, believe it or not, a song that predates even our first EP, For the Birds. We actually recorded a slower, more relaxed version of this song for that EP and ultimately decided on keeping it in the vault. We always knew it was going to be a banger, but we just didn’t have it quite right. We stripped it down to its basics and rebuilt it from scratch, and it’s never sounded better. It’s a fast paced, ever changing track with a huge outro and crazy wah guitar solo which puts the finishing cap our EP, and this era as a whole with a bang. Mosaic is a jam we used to finish our live set that tags onto the end of Abating God. We can’t play Abating God without playing this jam, so it just didn’t feel right finishing this EP without it. This EP was a blast to make and has us finding our groove as a band, and for us, Mosaic epitomises this feeling. The song’s title continues with our colourful theme, and represents all the moments that make up the EP and the artwork that reflects it. The Carvel EP is out on April 27th. Pre-order now on iTunes, Google Play and Amazon.